My friends Ashley and Heidi (in the first photo) thought of all of the cute details. The theme was "Falling in Love with Baby", and it was ADORABLE! 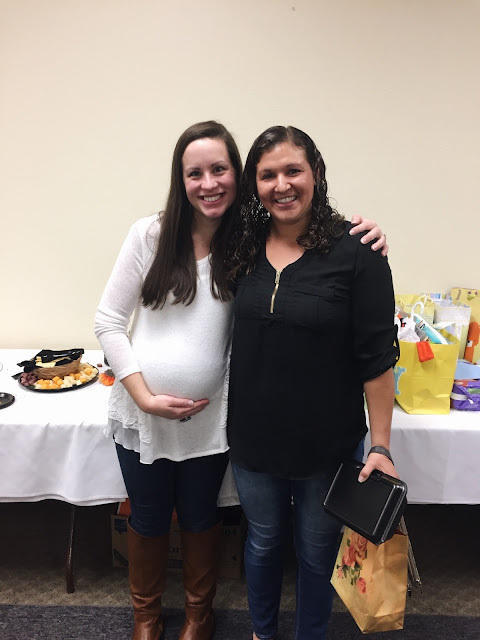 The table was full with fall-colored donuts from the best donut shop in town, the prettiest diaper cake, favor bags, and presents. The tables were set with lovely flowers, multicolored leaves, acorns, and little pumpkins. All of the details were perfect. We dined on bruschetta, spinach-artichoke dip, salads, and rich Italian entrees. My mother-in-law Alice, me, and my mom. Baby #3 received some adorable new outfits, blankets, and books. And he is now set with bags of tiny diapers and wipes! Even though it's our third boy, and we have plenty of boy clothes, it's so fun to receive a few new things for our brand new baby. My friend Briana lives an hour south of us, so I was so happy to see that she came! She also has three boys, so we bond over that. The favors were bags of cinnamon sugar Chex mix with Reese's pieces and candy corn. Yum! My friend Dianna is due the same day as me! She already has her three boys, and is eagerly awaiting #4 - a GIRL! This is absolutely wonderful! I'm so glad that you are blessed with such wonderful friends and family. I'm a firm believer that every baby should be so celebrated! What a sweet shower, and how great that your friends were able to surprise you!